You have set up Skype or another audio program. While the headphones work and you can hear just fine, there is simply no microphone signal at all. 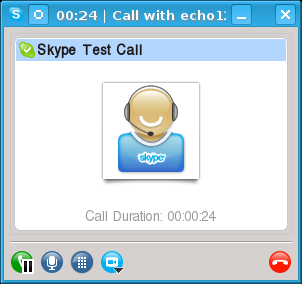 You do the Skype audio test call, as we see here, and you hear the automated prompt telling you to speak. But when it is played back, you hear nothing. Before going further, make sure that that your audio peripherals are correctly plugged in. If you are using the audio connectors on the front of the case, they must be correctly connected to the motherboard and sometimes they are not. Try using the connectors on the rear, which are directly on the motherboard or the separate sound card. Remember that "Microphone" means a non-amplified microphone signal, like a headset, while "Line in" means a line-level signal from another piece of equipment like a CD/DVD player, MP3 player, and so on. If the problem was not fixed by switching to the rear panel connectors, the problem is probably that you have two microphone inputs and the wrong one is selected. 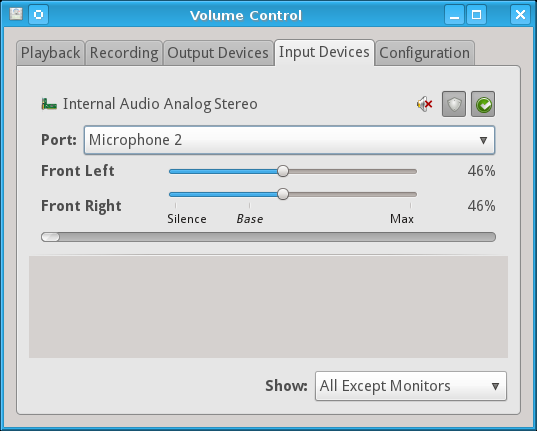 Start the Pulse audio volume control application with pavucontrol as seen here. Click the Input Devices tab. Click the pull-down menu beside Port and try selecting the other microphone. Here, I have switched from Microphone 1 to Microphone 2, solving my problem. Verify that you see the level meter bar graph move as you speak. The input level meter bar graph is at the center of the panel, just below the "Front Right" slider, below the words "Silence Base Max", and above a light grey empty box. It is nearly at zero in this screen capture. Set the input gain to a reasonable level. It should move most if not all the way to the right on peaks, but it should spend the majority of the time below 50%.